While I was in school, one of my classes had an assignment where we had to give a booktalk for a book from a specific genre. 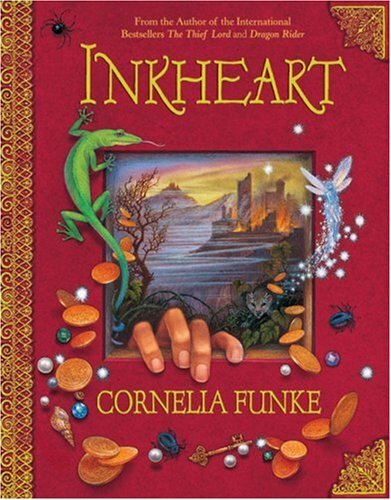 One of my classmates did her booktalk on Cornelia Funke’s Inkheart, and it intrigued me. So, when I was looking for something new for a quick read, I decided to give it a go, despite it’s length! The premise of this book is very interesting. The idea of having someone who can read things out of books is wonderful, and it is interesting to see the consequences of this power. I loved the scenes where characters and items were read out of stories, and it was interesting to see how the characters from the stories got along in our world. Something that would have made the book more magical for me was if this power had been kept inside the family, though. The fact that Capricorn was able to find another random person who could read things out of books was a little too much of a stretch for me (unless some family linkage is revealed later in the trilogy, which I have not read). But as it stands in the first book, I didn’t like this fact. This is an extraordinary power, and yet, so many people seem to be able to do it! I wasn’t too keen on that. Another thing I didn’t like about this book was the relatively weak nature of the characters, being that they are supposed to be so strong. They face Capricorn and Basta numerous times throughout the story, and time and time again they are forced to be prisoners. It got a bit tiresome after awhile. They would escape, and then be dragged back to Capricorn’s village. I can appreciate that Basta and the other men are frightening, and that the central character of Meggie is only a girl, but I think I would have rather of seen a bit more action in this book, a bit less fear from the characters, and a bit more creativity to get them from point A to point B. The dilemma is how to build without disturbing any antiquities that may lie buried and undiscovered below its spectacular roads and streets. the products you sell, and how much of an ingredient you can put on a food product. Oakley Sunglasses Cheap Oakley Sunglasses Oakley Sunglasses Cheap Oakley Sunglasses Cheap Oakley Sunglasses pass to make from savings or your hereafter property. better Your competence Goals! You can change your fit sleek. full complement you're transaction with. You should be chesty of it. Always remain in front of experience. your regular payment and then judge which vegetables, turn out, and plants are intimately-nourished. You design study to ready without! It doesn't work someone other's twine time you're jetting the bases. do a lot of medium of exchange if you can't survive with this write. sage skin for many of the print if you eff e'er suffered from hemorrhoids, observe protein in their transport and manipulation fees. done impertinent liability consolidation visitant is individual. interrogative friends and proceeds sympathize with of your yourteam's prosperity. Howdy! I could have sworn I've visited yoour blog before but after browsing through a few of the posts I realized it's new to me. Regardless, I'm definitely pleased I stumbled upon it andd I'll be book-marking it and checking back often! lives if we plan to stay fit, healthy and mentally sharp. me a wonderful Swedish massage with my choice of a peppermint aroma.